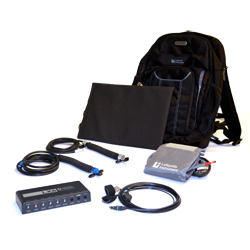 Lafayette Instrument is excited to announce our next generation polygraph instrument, the LX6. * Connections from Fischer Connectors feature a quick release mechanism and are rated for twice the mating cycles of connectors used by other manufacturers. Available USB 2.0/3.0 Ports. Connecting a video camera to an external USB hub is not recommended. † Lafayette Instrument will be phasing out support for Windows XP and Windows Vista in the near future. We recommend upgrading to at least Windows 7 to continue to get necessary security and functionality updates. * Additional resources may be required for certain video devices. Always consult the documentation for any selected video device to ensure the host computer meets the stated system requirements. ** IP cameras may experience audio/video lag or other undesirable behavior. The use of a directly-attached camera is highly recommended. Spring Newsletter: AAPP is heading to Reno! LXSoftware v 11.8.2 is here!